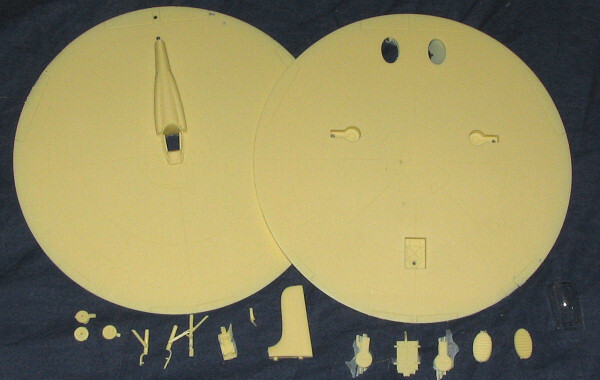 Basically, most of the kit mass is the upper and lower fuselage halves. No need to fuss over wing alignment on this one. It appears that there are alignment pins/slots for the upper fuselage, but I'll have to wait to see how this works once I remove some of the resin pour stubs. There is a cockpit which includes a seat and control stick. The kit seat is detailed with belts and is much better than the average Anigrand kit. Canopy is fairly well done, but lacks easy to see framework detail so masking will be tricky. You get sturdy landing gear and wheels and since the kit isn't very heavy, with these short gear, things should be just fine in terms of weight warpage. There is also a set of louvered jet exhaust and an upper wing fin assembly. Gear doors are a tad thick, but well formed. Thanks to a non-complex shape, those wishing to replace them with card stock or brass sheet won't have any problems in this area. While it doesn't seem as if any nose weight is required, I'm gun-shy and will put in a tad just in case. This is the kind of stuff that many of us really like. It is perfect for the 'whiffers' out there to put in SEA camo or some other unusual marking. The rest of us will be happy to do it as it comes and then wait to see what else about this comes out in the public over the years. 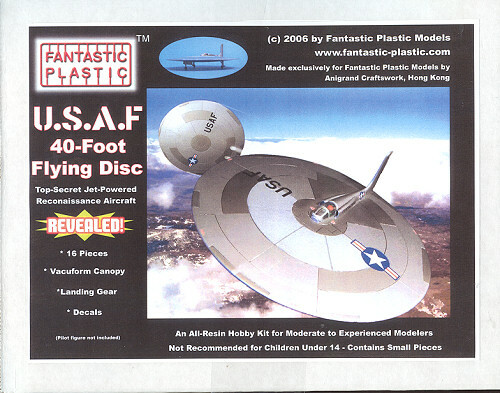 I encourage you to give Fantastic Plastic your support so he can bring out some of his most interesting projects. Unsurprisingly, this one is already being prepped for construction!